Construction materials for the mansion were tabby brick made from sand, shells and crushed oyster shell lime. Although still a bachelor, Gamble wanted to build a lavish home. The north section was built first, separated from the main building by the breezeway or “dogtrot” as our very knowledgeable tour guide, Ranger Jesse Toney, explained it was called back then. “The breezeway separated the main house from the kitchen, and that’s where the dogs stayed,” Toney said. 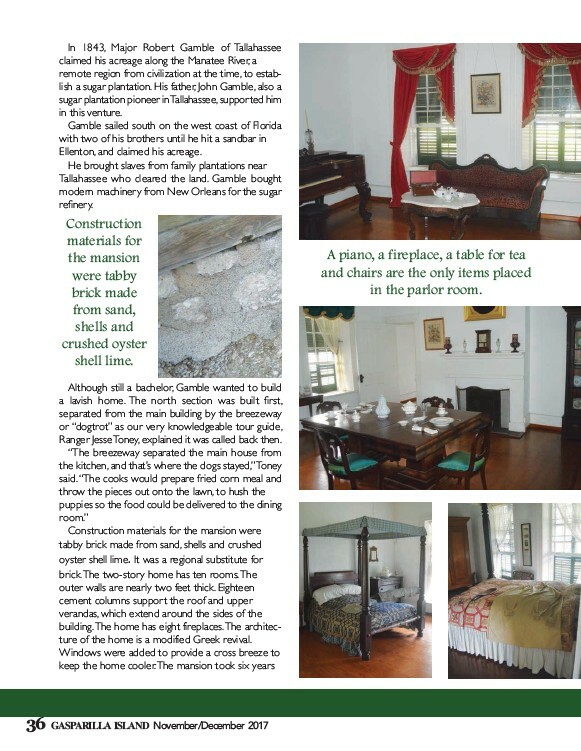 “The cooks would prepare fried corn meal and throw the pieces out onto the lawn, to hush the puppies so the food could be delivered to the dining room.” Construction materials for the mansion were tabby brick made from sand, shells and crushed oyster shell lime. It was a regional substitute for brick. The two-story home has ten rooms. The outer walls are nearly two feet thick. Eighteen cement columns support the roof and upper verandas, which extend around the sides of the building. The home has eight fireplaces. The architecture of the home is a modified Greek revival. Windows were added to provide a cross breeze to keep the home cooler. The mansion took six years 36 GASPARILLA ISLAND November/December 2017 A piano, a fireplace, a table for tea and chairs are the only items placed in the parlor room. In 1843, Major Robert Gamble of Tallahassee claimed his acreage along the Manatee River, a remote region from civilization at the time, to establish a sugar plantation. His father, John Gamble, also a sugar plantation pioneer in Tallahassee, supported him in this venture. Gamble sailed south on the west coast of Florida with two of his brothers until he hit a sandbar in Ellenton, and claimed his acreage. He brought slaves from family plantations near Tallahassee who cleared the land. Gamble bought modern machinery from New Orleans for the sugar refinery.